The horizontal dimension of a rotary-draw bending clamp die or pressure die parallel to the cavity of the die block; the dimension of such a block from its leading face to its trailing face; the dimension of a such a block lying in the plane of bend and perpendicular to block’s reach corresponding to the Y-axis of the tube-bending machine. Usually the cavity length of clamp die or a pressure die is the same as the block length, but they can differ in the case of a notched die with a block length greater than the cavity length. 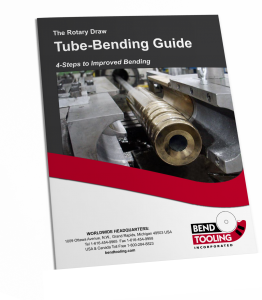 For example, most models of rotary-draw tube-bender have a minimum block length for mounting purpose, but the cavity length must be shorter than that minimum length to accommodate the restrictions of the part to be bent (typically a multi-bend part with a short mid-tangent). So attention must be paid to specifying the length of clamp dies and pressure dies in these situations.